Chameleons are carnivores, which means they consume animal matter. They won’t consume vegetables or fruit. Some chameleons will very occasionally eat leaves, which is why it’s important any live plants in the cage are non-toxic. I’m not exactly sure why they do this—I’ve observed it just a couple times, and only with Veiled chameleons—perhaps it’s because they come from a very dry climate. Some of the bigger species of chameleon have been known to eat small rodents such as mice, but I don’t advise offering live mice because there’s a risk one could injure your pet lizard with a bite. Pinkie mice, which are newborns, are fine to offer once in a while to the larger species if you’re so inclined. I personally don’t feed my chameleons any rodents. Interestingly, the Meller’s chameleon is also known as the “Bird-eating” chameleon, due to some anecdotal stories of their eating small birds. Parson’s chameleons, another species that gets massive in size, has been known to eat small finches in the wild. While this may sound surprising, keep in mind, chameleons live in trees, and they’re opportunistic feeders. In the wild, various bugs form their primary diet. 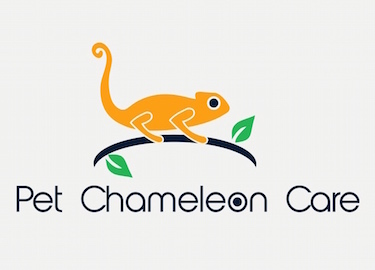 Chameleons will eat a variety of insects in captivity, but which are best for them nutritionally and otherwise? Below I’ll cover some of my most recommended, and least recommended, feeder insects for your pet chameleon. Crickets are, in my opinion, easily the best staple food for chameleons. The captive diet of all my chameleons is comprised of approximately 90% crickets, and I’ve been very blessed with a tremendous amount of success keeping, breeding, and raising chameleons for years on this cricket-based diet. Variety in one’s diet is a great thing, and I’ll cover a few other excellent feeder insects as we progress, but there’s really no need to reinvent the wheel here. Most chameleon breeders, if not all, feed their chameleons a cricket-based diet. They’re nutritious, low in fat, high in protein and calcium, easy to keep, inexpensive, and very active. When you put crickets into your chameleon’s cage, it’s almost like they know what to do—they usually immediately start climbing up the screen sides of the enclosure, at which time the lizards start picking them off one by one. You’ll recall that I mentioned my chameleons eat crickets 90% of the time—but what about the other 10%? Well, that’s composed of roaches and hornworms. Roaches are a great additive for chameleon diets as well. I’ve always stuck with the Dubia and Madagascar hissing species, but there are quite a few other varieties to choose from as well. Each species of roach has its advantages and disadvantages, although I actually can’t think of a single disadvantage with Dubias. Roaches are super high in protein, low in fat, simple to maintain, and inexpensive. Dubai roaches don’t climb smooth surfaces, they don’t make noise, they don’t bite, they don’t fly, and they don’t jump. Many chameleons are ravenous for these, so I highly recommend giving them a try. I have some chameleons that grab them as soon as I place them into the cage, and others that grab them right from my fingers. Madagascar hissers are considerably larger, and they can climb smooth surfaces, as well as make a “hissing” noise be forcing air out of their bodies—although they’re harmless. Madagascan chameleons seem to relish them more than other species, but they’re another feeder that’s worth trying. They make a hearty meal for your chameleon. Hornworms are a succulent feeder insect that my chameleons eat with gusto. These are those bright green caterpillar-looking worms that are also known as “Tobacco” worms because they frequent Tobacco fields in the South. The sharp-looking “horn” on them is just a soft, harmless, fleshy decoration. They are usually purchased as 1-inch juveniles, but they grow to become 3-4 inch beasts. These worms are low in fat, high in calcium, and extremely high in moisture (80%-85%). The main reason I feed these to my chameleons is because of the moisture and hydration they provide, especially for newly imported chameleons which are usually somewhat dehydrated from the trip. They provide a nice hydration boost for your established pet chameleon as well, which is why I include them as a regular fixture in my feeding regimen. You certainly don’t need to feed them to your chameleon(s), it’s just something I choose to do. They usually arrive in cups with pre-mixed “hornworm chow” affixed to the bottom, but just be aware that they’ll eat tomatoes as well (just don’t feed them tomato leaves). 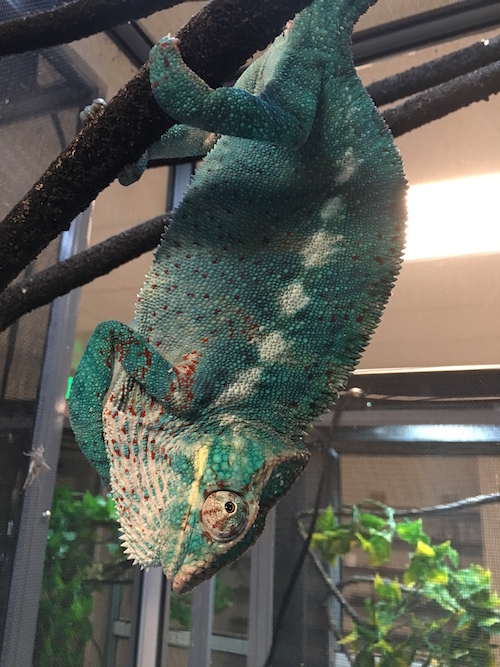 Waxworms aren’t an ideal staple food for chameleons because of their relatively high fat content, which is higher than that of crickets, mealworms, giant mealworms, superworms, hornworms, and roaches. They’re ok to offer once in a while, especially for any chameleon that needs to put on a little extra weight. I offer waxworms to some juvenile chameleons that are growing quickly, and sometimes to females that have recently laid eggs. They’re high in protein and calcium, and like hornworms, they’re full of moisture and are soft-bodied which makes them easy to digest. They don’t eat anything, either. Keep them at room temperature, and don’t put them in the refridgerator. Most chameleons eat waxworms with delight. When I do offer them, I usually place them one-by-one onto the artificial vines inside the chameleon’s cage. The waxworms generally just crawl up and down and around until they get hammered by a speeding tongue. Mealworms, giant mealworms, and superworms are also eaten by chameleons, but not to the extent of other feeder insect options. I rarely if ever offer them to my chameleons, mainly because the other options are so much better in my opinion. Again, why reinvent the wheel? I have noticed that superworms and giant mealworms will usually climb the screen cage walls, which is nice because it allows the chameleons to eat them easily. If you do choose these as chameleon food, you may want to use a dish instead. Check out my feeder insect page to purchase the feeders your pet reptile needs today. a species rarely seen within the reptile hobby. Make sure the rim is rounded and not sharp like freshly cut plastic, as the chameleon could injure or cut it’s tongue. The dish must have some weight, or the force of the tongue will topple it or send feeder insects flying all over the floor. Use a dish that has solid sides, and not clear sides, to avoid confusion. Sometimes chameleons shoot their tongues at the side of the dish when it’s clear. I personally no longer use food dishes with my chameleons because my automatic misters end up spraying too much water into them, which leads to a mess. My misters go off 6-8 times per day and they cover most of the enclosure with mist. Once again, why mess with it when crickets work so well. But, if you’re set on using a food dish, there’s nothing wrong with that in my book. You might consider attaching the food dish to the screen side higher up in the cage, sort of like its up in a tree. 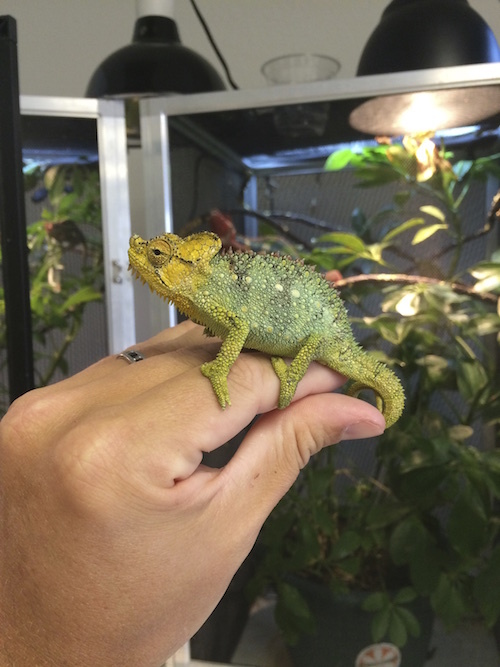 While I don’t personally catch local insects for my chameleons to eat, if you have the ability, it’s a highly encouraged activity that will add a lot of variety to your chameleon’s diet. Grasshoppers are often a favorite food for chameleons, just snip off the hard part of the legs prior to feeding them to your chameleon(s). Make sure the area you’re collecting in is free of all pesticides. One strategy is to have another person with you, and each hold one side of a blanket. Then, just walk briskly across the field, letting all the feeder insects jump and fly into the blanket as you go. When you’re finished, fold up the blanket quickly and start sorting. Zoo Med used to have an insect catching product that trapped live bugs into a cup reservoir at night using a light to attract them. It never worked for larger insects, but it did pretty well for small ones. Maybe 15-30 per night. Supplementing what your chameleon is eating with a quality calcium or multivitamin is highly advised, but not too often. Frequency is key—too much is dangerous. Also, don’t mix calcium with multivitamins in the same feeding—use one or the other to avoid diminishing their usefulness. I feed my baby chameleons pinhead crickets or hydei fruit flies that have been powdered with calcium about every other feeding, and with a multivitamin about once per week. Their bones are growing quickly, so they need calcium more often than adults. You definitely don’t want to overdo it with the multivitamins. My juvenile chameleons get calcium added to their food about once per week, and multivitamins added once every 10 days or so. My adult chameleons get calcium 1-2 times per month, and a multivitamin 1-2 times per month. I’ve settled on Repashy supplements for my chameleons, as I’ve been pleased with the results. Specifically, for calcium I use Repashy SuperCal LoD (Low vitamin D) and Repashy SuperCal NoD (No vitamin D). Chameleons don’t need a lot of extra vitamin D added to their diets because they’re getting plenty of access to UVB rays. I use Repashy Supervite as my primary multivitamin supplementation. Gut-loading your feeder insects prior to feeding them to your chameleon is something I’d consider highly important. Now, it’s true that an insect’s stomach is a very small percentage of its mass, but over time, when it’s full of kale or carrot each time your chameleons eats, the benefits are noticeable. Gut load an hour or two prior to your chameleon’s feeding time. If you’ve got any other questions about what chameleons eat, just drop me a line! Here are links to two supplements I use regularly when successfully breeding and raising my chameleons. Chameleons tend to really like stick-type insects such as the Praying mantis. 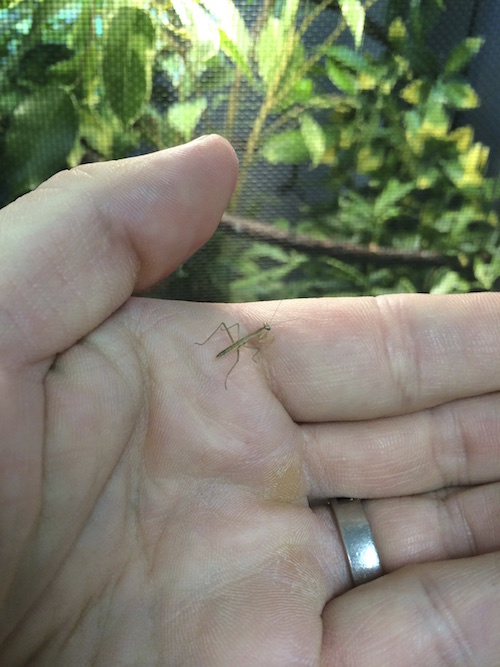 You can purchase “ooths” which hatch-out hundreds of baby mantids.